On the way into work approaching a roundabout the guy ahead of me pulled away to take the first exit, I followed looking back across the roundabout to check it was clear. SMASH! Front flip over the bars. SLAM! Land on his boot lid. THUMP! Roll onto the ground. Ouch! He’d stopped to give way to a slow car that neither of us need have stopped for, I don’t really know why he did. I saw it, saw I had loads of time to pull away and take my exit but we are where we are. I was pretty winded but okay, so got up and turned the bike off before using mega adrenalin strength to pick it up and roll it out the way. Another driver came over to check I was alright, apparently it looked pretty scary (Achievement Unlocked: Scary looking motorcycle crash). Then went to say hi to the diver of the car I just dismantled my bike with. The guy I hit had done nothing wrong, aside from change his mind about giving way mid-way into the roundabout which I suppose he’s entitled to do. And I’m just some knobhead who smashed into the back of him and made him late for work. So I was expecting full-on confrontation/anger but what I got was genuine concern for my wellbeing. He didn’t bat an eye at his own car and once he’d established I was in one piece just wanted to help me with the bike. After we’d swapped details and assessed the horrible state my bike was in we turned our attention to his car, and unbelievably it was barely scratched! There was a tiny scuff by the licence plate but that was it. He said he’d take it to a garage that afternoon, have them look it over, get a quote to fix it and let me know. He was gutted about my bike and I could see he felt bad, probably not helped by the look on my face picking pieces of it up out of the road. He asked if there was anything he could do to help but I was only around the corner from my office so I let him get on his way. 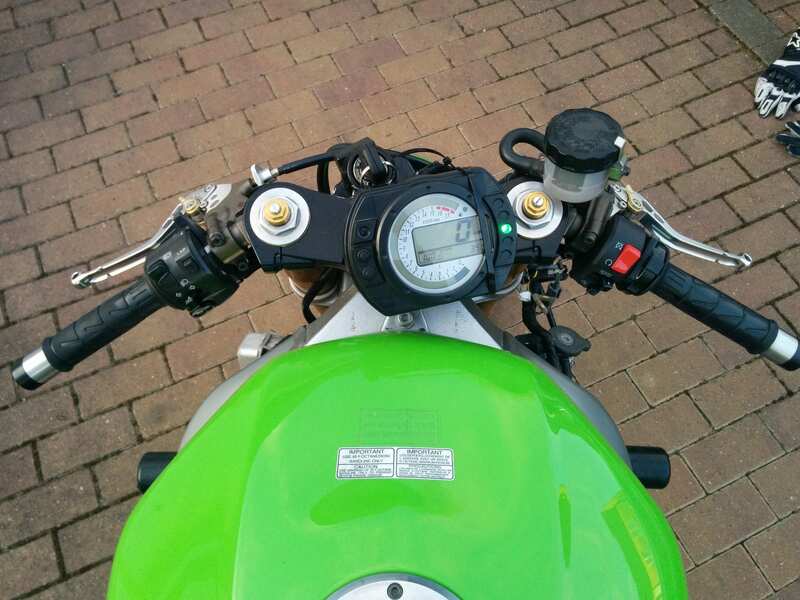 The bike started up fine once I managed to get it out of gear (not the easiest thing with a snapped footpeg bracket). There were no leaks or any horrible smoke bellowing out of it but just about every panel of fairing was smashed to bits. 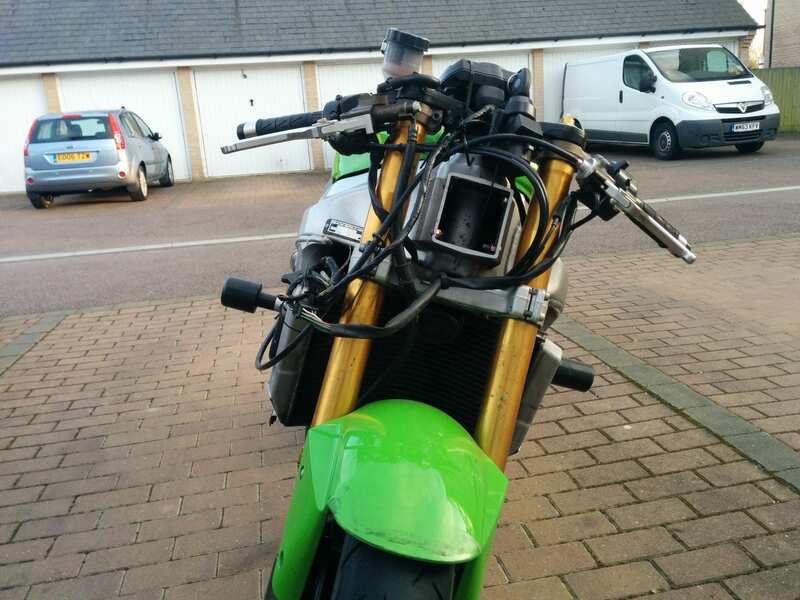 The whole front end was wrecked with bits hanging off all over the place and the front wheel was rubbing the the fairing below the radiator, I needed some cable ties! B&Q was on the way ’round to the office so with some really funny looks I limped the bike into their car park, grabbed a bag of ties and tried to rig the fairing up so nothing was going to fall off or foul anything that moved. I couldn’t call what I ended up with a success and I had a feeling that for the wheel to be rubbing the fairing how it was something must be bent. Slowly continuing my limp over to the office all the cable ties gave way on the last corner, some horrible noises happened and I had to get off and push the bike into the closest parking space I could find, which fortunately happened to be for my brother’s office (coincidently works opposite me) so no one was going to moan. With the cable tie plan not working and a high chance something was bent there was no way I could ride the bike home without taking all the fairing off, so come lunch time that’s what I did. Took me a little over my lunch hour, but if you’ve been in a motorbike crash people make allowances. All the fairing bits, headlight, etc. went into the back of my bro’s car and then I jumped on my bike and took a ride over to my own parking space to see how it felt. Weird! It felt really weird… but ridable. It was going to get me home okay, if also causing a bit of a spectacle in the process. Riding through town Mad Max style was really funny. 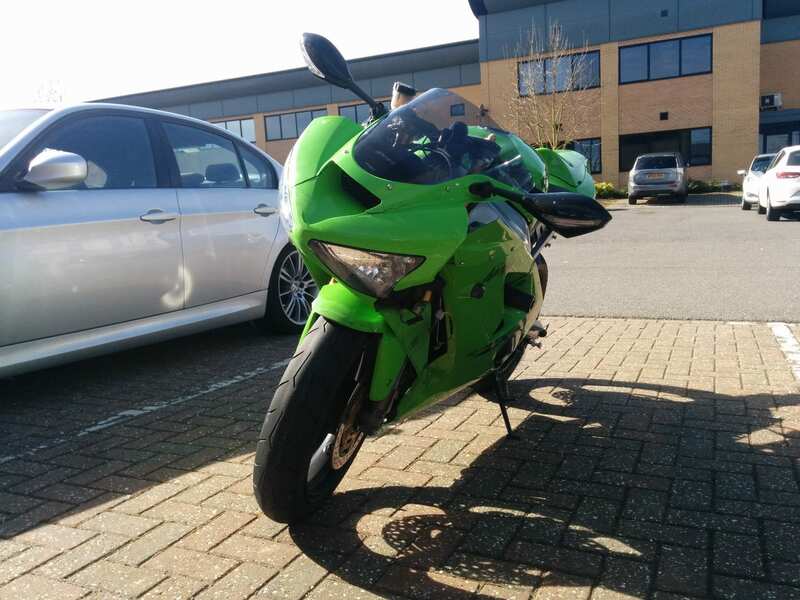 The bike was turning more heads and got more waves and thumbs-up naked than it ever did on its best day with all the fairing on. It did feel odd to ride though. On closer inspection it looks to me like the frame is slightly bent, and that was partly why the wheel was rubbing the fairing. 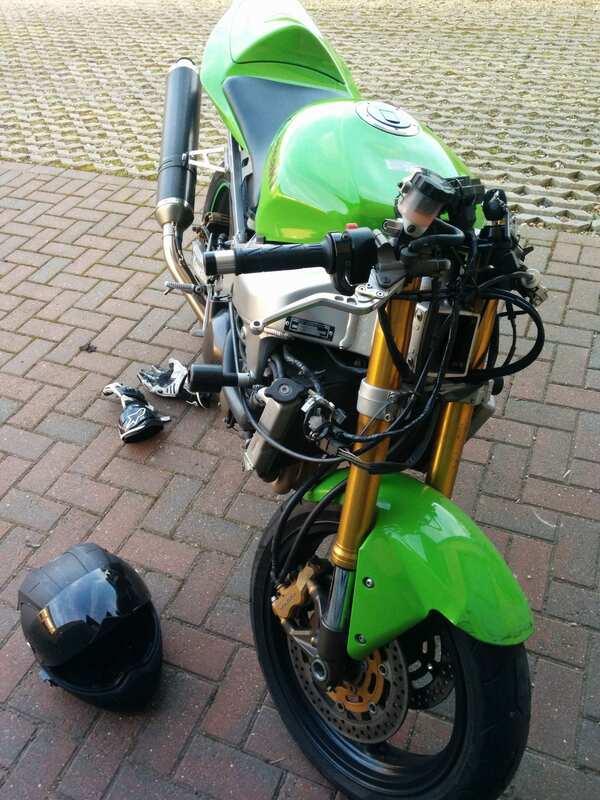 Even though it was fully insured, they’d just write it off and I don’t want to lose my first bike so I’m going to rebuild it myself, and better than ever! That evening I got a text from the other driver saying the garage checked over his car and that it was fine. 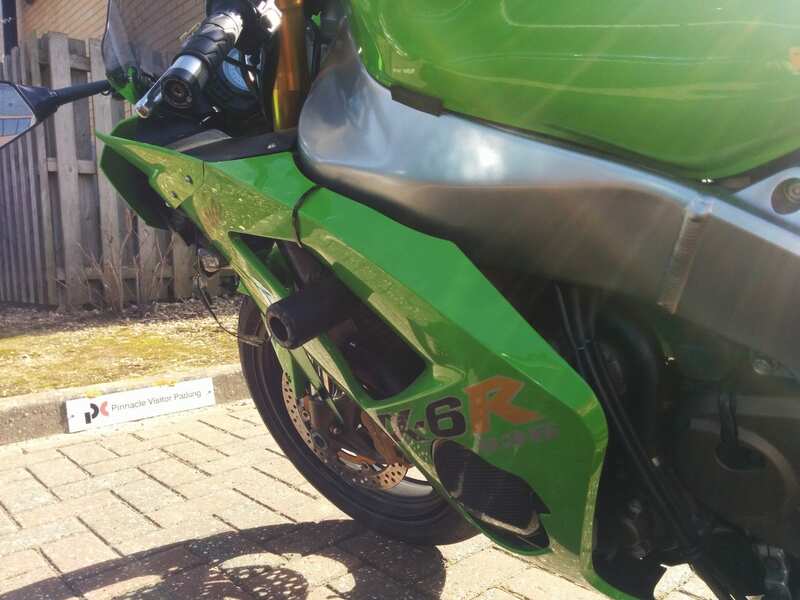 He wasn’t bothered about his new little paint scuff and despite my offering to get it fixed on several occasions still declined and told me to just worry about getting my bike back on the road asap. What a hero! I had been thinking about breaking the bike down anyway, sending parts away for powder coating and rebuilding it over winter so now’s the perfect time to go ahead with that and make a few extra changes while I’m at it. 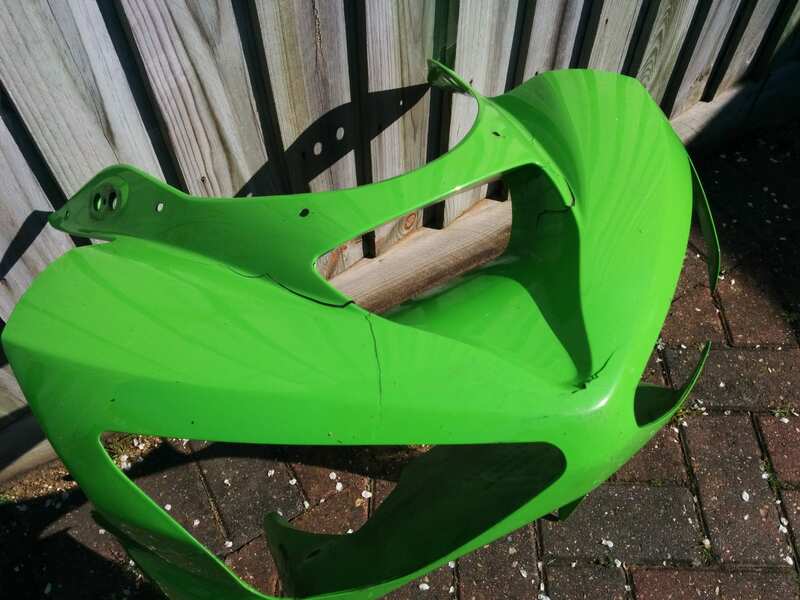 As the front of the frame is bent anyway I’m thinking a stunt frame would look really good, need to look into those. Gutted I’m going to miss the whole of this seasons riding, I haven’t got the space or the cash to get a second bike at the moment. I’ll be throwing enough money at just buying in all the new bits ready for the winter build, top of the list being an 07/08 rear swing arm. Sorry bike, I’ll make it up to you, I promise.